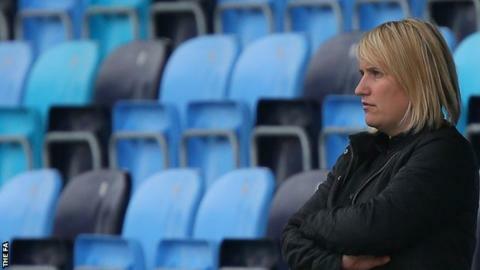 Chelsea Ladies boss Emma Hayes says Women's Super League crowds could grow to 4,500 within the next five years. Manchester City saw a club-record crowd of 2,102 for their game on Sunday, as average WSL 1 attendances rose by 78%. "It's progress," Hayes told BBC Sport. "It's women's football and you're not going to go straight from 500 fans to 50,000 fans. "It will go from 500, to 1500, to 3000 and probably top out at about 4,500 at some point in the next five years." In the first half of the season, the average WSL 1 attendance was 892. By contrast, at the four WSL 1 matches on Sunday, 12 July, there was an average crowd of 1,588. A crowd of 1,233 watched Hayes' Chelsea beat Bristol Academy 4-1 at Staines Town on Sunday. "Of course we're pleased," said Hayes. "Players like to play in front of a big crowd, and it makes a big difference." Bristol goalkeeper Mary Earps added: "Staines and Chelsea don't normally get big attendances here but over 1,200 is absolutely fantastic. "Having millions of viewers for the World Cup can only do great things, in terms of people coming to watch the game, investing in the game and believing in women's football as a sport and as a spectacle."